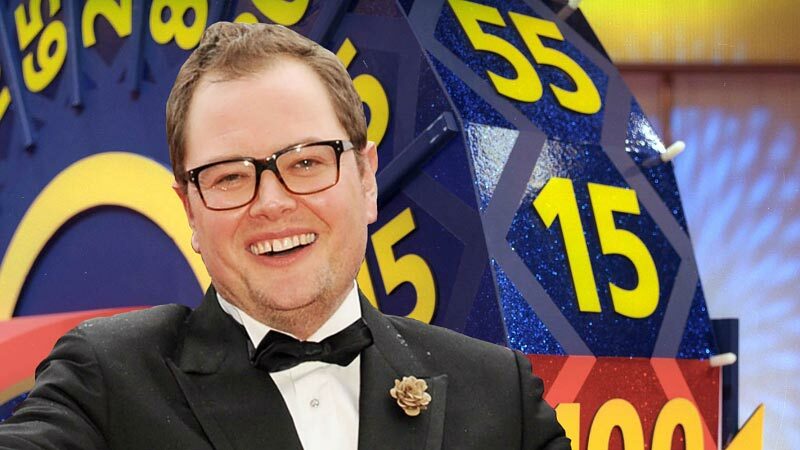 You’re presenting one of the all-time great gameshows on Channel 4 this Christmas, The Price is Right. Why did you want to bring it back? Well, I love the way you think I’ve got all this power. "I want to bring this back!" And Alan gets what he wants! No, they asked me if I wanted to present it, and I loved the show. When I was there on the set, it actually felt quite emotional for me, seeing all the games like Plinko, and Cliffhanger. It was funny how much they’d stuck in my head. It was a no-brainer for me, and like I said at the time, it was proper bucket-list stuff. It was something I’d watched as a kid growing up, with Bruce Forsyth and Leslie Crowther. So when they asked if I wanted to do it, I jumped at the chance. Explaining The Price Is Right is probably going to make it sound like the most moronic show ever. I invite people out of the audience to guess the price of a series of household objects. It’s a bit like when you try and explain Deal or No Deal, isn’t it? "Well, there are 15 people, and all of them open a box, and it’s got a number inside." Although it sounds very basic, there’s a lot of skill involved. It’s just a celebration, really. It’s one of those things we all like to do – guess the price of things – and I think now it’s very fitting to do it at Christmas. Everyone will have had rubbish presents from their family and be thinking "How much did they pay for this?" so we’ll all be in the right frame of mind. But I was so nervous doing it, it’s been so long since it was on telly, and I worried if there was still an appetite for it. But as soon as I came through those doors, and experienced the genuine excitement of the audience, it was amazing. I got to the 'c' of 'Come on Down!' and they were screaming and shouting. And I loved the fact that everyone in the audience wanted the contestants to win. It was really lovely. Yeah, I know! It was funny seeing 400 Mancs screaming "£19.99" about a spiraliser that makes courgetti spaghetti. That’s one of the joys of filming up in Manchester. You get the best audiences up there – they just throw themselves in! It was great, really good. Obviously I loved Sir Bruce. But the thing is, I not only watched the English version, the production company sent me the Spanish one, the American one, and the French one. It’s funny how they all do it differently. In America it’s been on every day for 40 years. So it works, you know it works! It is a classic. It’s not like one of these new shows, where nobody can figure out what’s going on. But I definitely think Brucie was the master of it all – his way with people, he’d get people to be willing to have the mick taken out of them. He got the tone just right. He died just after I made the show – I’d have liked him to have seen it, I hope I did him proud. Do you think part of the attraction of The Price Is Right is that the concept is so simple? Yeah, that’s it! It was part of the golden age of gameshows, along with The Generation Game and Blankety Blank. They work. There’s a reason The Price Is Right is on in every country in the world. It’s simple, and people want to know the price of things. Plus we give away brilliant prizes.